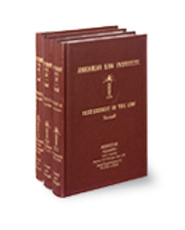 Helps you understand, interpret, and apply American common law of torts. Respected judges and scholars contribute to explain what the law should be. Lucid and concise coverage, sound and logical reasoning. Often used and cited by the courts. Restatement of the Law, 2d, Torts, revises and supersedes the original Torts from the 1930s.